Mrs. Wilma Landman lost her husband Jakob Vos in 1967 during the most severe gale that ever hit the shore. 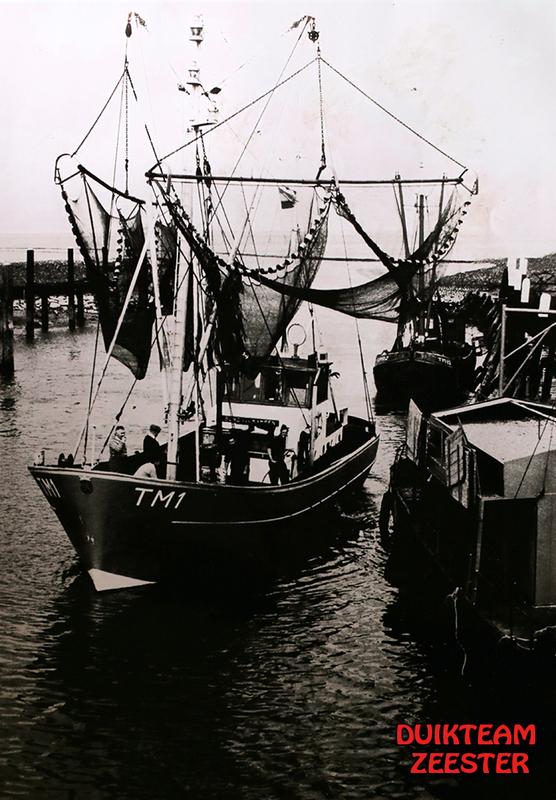 Wreck divers from Lauwersoog stumbled by accident on his fishing vessel, the TM 1 from Termunterzijl. And they did an extraordinary find, especially for mrs. Landman. The wind is screaming through the booms. The ship TM 1 Burgemeester van Kampen heavily rolls on the seven meter high waves. Wind force 11, with peaks up to hurricane strength. Skipper Jakob Vos calls the German coastguard . Mayday! Mayday! Near the German island Heligoland the TM 1 has become rudderless and is at the mercy of the wild sea. The German rescue ship Adolph Bermpohl heads to Vos and his two deckhands. ,,Please repeat again, do you want to be taken off board or do you want to get towed to Heligoland?’’, the German rescuers shout through the VHF channel. Noise and cracking disturb the line. ,,Tow … we have … full of water and that needs to get out … ’’, they hear Jakob Vos reply. The wheelhouse has been smashed off the fishing vessel. The skipper just manages to make himself heard. Within half an hour the German rescuers report that they will send the daughter ship to the Burgemeester van Kampen . The smaller boat will pick up the men and return to the safe haven of Heligoland . In the meantime it has become almost dark. ,,Be careful and put on a lifejacket.”, emphasises one of the rescuers to the fishermen. Wilma Landman (71) looks at the book of the German coast guard. 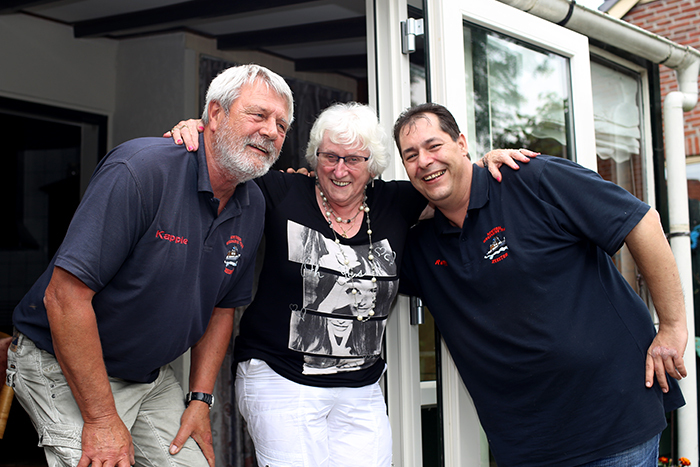 In her living room in Termunterzijl her eyes glance at the dialogue between the German rescuers and her husband Jakob Vos. She has read it many times before. What exactly happened will for always be a mystery. What she does know is that it was that February night that her Jakob forever stayed behind on the other side of the Dutch dike. Jakob and Wilma met when Wilma was 16. Jakob was 22 at that time. It was love at first sight, even though Wilma does really not believe in that. The love of water was what brought the two together. Wilma, the daughter of charter sailors, Jakob a fisherman at heart. Humour. Willpower. Courage. That’s what they recognized in each other the first time they saw each other at the port of Termunterzijl. Jakob was at work on his shrimper TM 1.
,,It was a tall boy, ” mrs. Landman tells. ,,Long and muscular. I found him extremely tough. And those eyes: they looked right through me. I was crazy about him straight away. My stomach turned. I was in love when I saw him.” Cupid also struck Jakob. That night he told his mother that he had met a girl. Wilma. Skipper Klaas Koch sets course towards Heligoland. On board seven enthusiastic wreck divers. 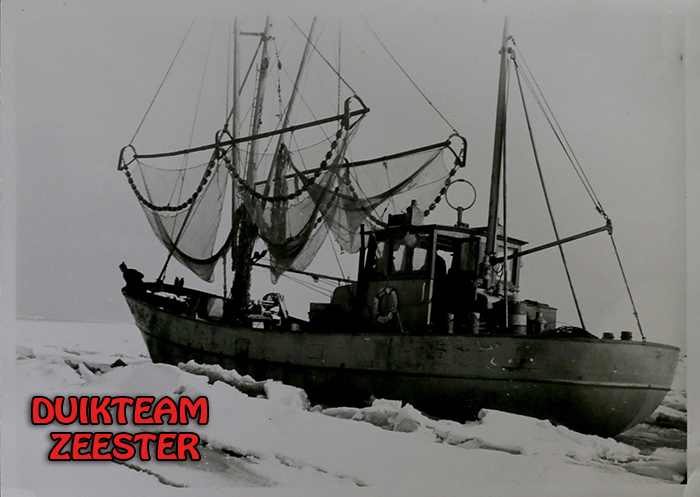 The diving vessel Zeester is on expedition and the men are on their way to a wreck that they had mapped a year earlier. They are looking for the wreck of the WR 6, which already lies on the seabed for about half a century. The ship has been lost near Heligoland. Arrived at their destination the men hoist themselves in diving suits. One by one they let themselves fall overboard. They soon see the fishing vessel – at about fifteen meters deep – partially buried in the sand. Sticking out from the hold are plastic fish boxes. The vessel is weather beaten, only the skeleton is left. In recent decades the marine life took possession of the ship. There is only one way to find out if this wreck is the WR 6, that’s to carefully tap the bow gently to visualise the welded letters. Two divers are knocking with hammers on the sediment covered bow. 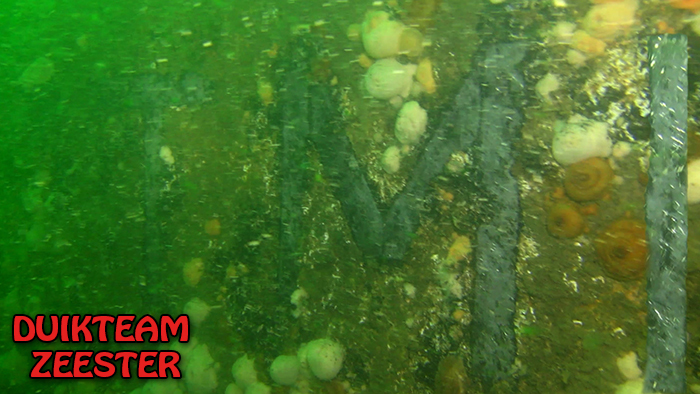 Slowly a T appears, then also an M. The wreck is not the WR 6, but the TM 1 from Termunterzijl. Diver Remy Luttik begins an investigation into the story behind the fishing vessel. Almost a year later, mr. Luttik sits at the table at Wilma Landman’s house in Termunterzijl. The photo books with black and white photos of a colourful past are displayed on the table. After the third cup of coffee, he clears his throat . ,,Wilma” he says. ,,When we dived Jakob’s wreck, we brought something up with us.” Mrs. Landman pays close attention. The diver then gives her a plastic bag with something heavy in it. She peaks in the bag. She gasps. Gently she picks up the horn of a VHF radio set that is in it. She holds the horn in her hands as if it were a new born baby. After half a century she finally has something tangible in her hands of the shrimper TM 1 on which her husband Jakob Vos sailed. 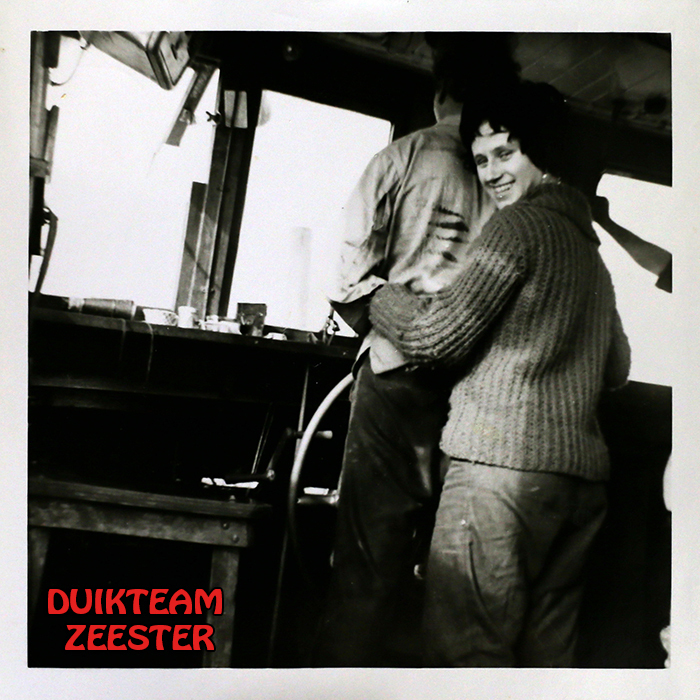 Diving team Zeester from Lauwersoog took the radio horn from the seabed. Now it is back home. Remy Luttik gets a big smack from mrs. Landman. Wilma gives Jakob a playful shove. ,,Wake up Jakob , it’s time.” It is around midnight. Wilma sees the reddish hair of Jakob sticking out of the duvet. She gets out of bed and puts the coffee on. Every Sunday she gets up with Jakob to drink a cup of coffee before he leaves for sea again. They chat a bit, joke around and then say their goodbyes. Jakob is sailing out that February Sunday night in 1967. Wilma knows Jakob will do his upmost best to fill the containers with shrimps as quickly as possible so he can steam back to Termunterzijl. Six weeks before his final departure Jakob stayed ashore for quite some time. Wilma could give birth to her second son at any time now. Jakob wants to be there. Because the ship is still docked, Jakob does some chores. He installs a second VHF radio below deck. It was just in case the wheelhouse would come off during a storm. If Jakob had not mounted that VHF radio, he never could have raise the alarm during that evening in 1967. Little Jakob (6 weeks old) cries all day. He is inconsolable for some reason. Also the two-year-old Kobus cries incessantly. There’s something in the air. Wilma has got a bad feeling. She is restless. Normally Wilma listens with half an ear to the fishing frequency on the radio. Not this time. Wilma’s sister Mia comes over for coffee. Wilma has to speak out. ,,I will not see my Jakob again”, she says. Mia frowns at her frown. ,,Did you drink?”, she responds. Wilma shakes her head. That evening Wilma is startled by loud knocking on her door. It’s her father-in-law. ,,The ship is lost.” he says. ,,But the boys are on a rescue ship. ” Wilma startles. They might be saved, but she is not convinced. 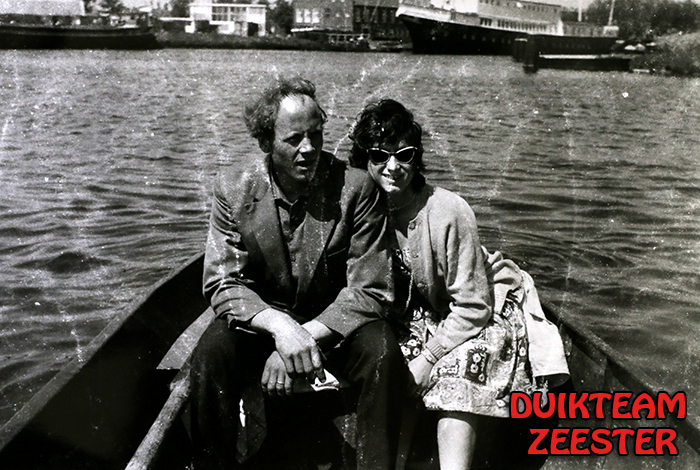 Wilma wants nothing more than to leave for Heligoland to fetch Jakob and the two deckhands Schelto Westerhuis and Rommert Bijma and bring them home. But she will not leave before she has heard Jakob’s voice. She waits for his call. That call does not come. That night Wilma hardly sleeps. Sometimes she dozes off and then startles awake. The minutes crawl past. After half a century she approximately knows what happened. 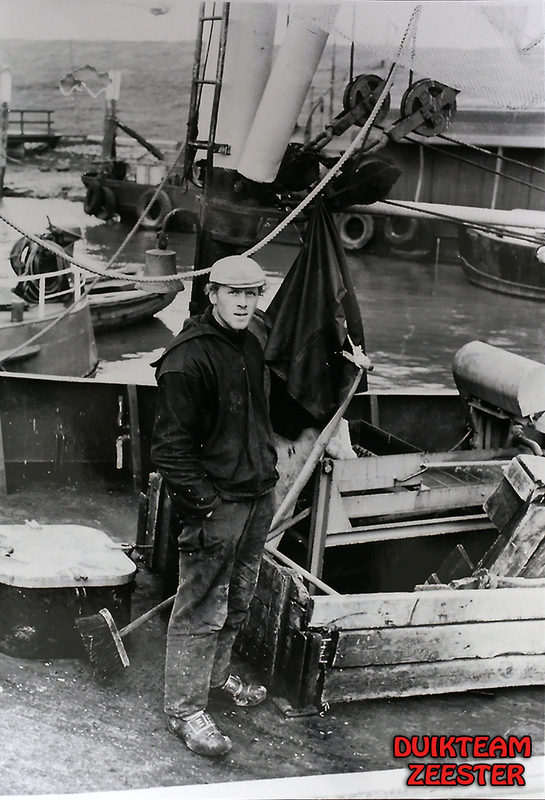 The three fishermen were taken off board by the daughter ship of the Adolph Bermpohl. Due to hurricane-force winds and wild seas the small ship could not be hoisted back on board the Adolph Bermpohl. The rescuers decided to sail with the small ship in the lee of the big ship back to the port of Heligoland. The lighthouse keeper at the north entrance of the harbour mouth at Heligoland sees two white lights in the distance. Probably the mast lights of the rescue and daughter ship. He is not really sure, the poor visibility does not make it any easier. Fifteen minutes later the lights have disappeared. After 19:00 it is not possible to make radio contact with Adolph Bermpohl anymore . 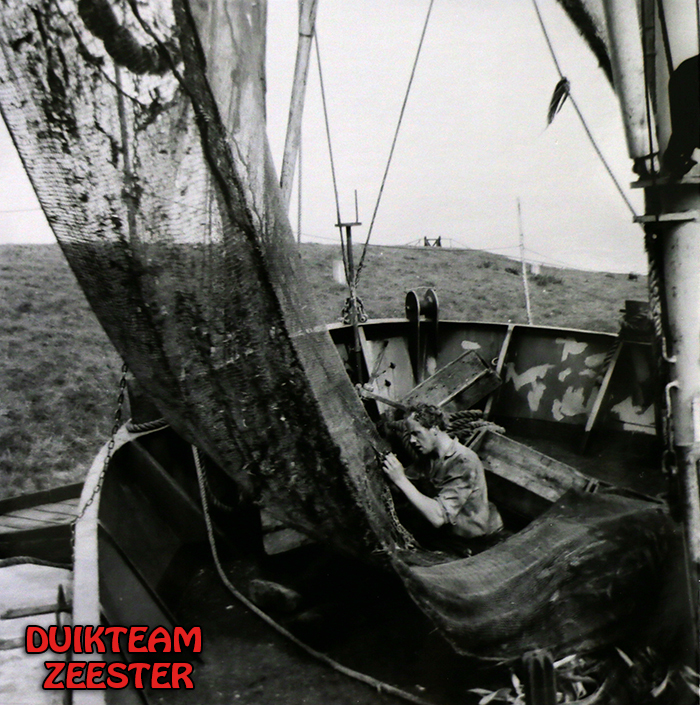 On the way back, with the fishermen from Termunterzijl on board, the rescue ships are lost. The big search for the sailors was without results that night. Probably the sailors are attacked by a groundswell, a broad deep swell of the sea. They disappeared into the dark wild water. The four German rescuers and the three fishermen did not survive. Mrs. Landman looks at the radio horn. It’s on display at a treasured place. A valuable still life. The longing for Jakob stays forever. ,,People sometimes say: ‘It is fifty years ago.’ But it’s part of my life.” She moves sitting up straight. There is that smile again. ,,I really think that I have found my way in life again nicely.” She married a second husband , Dikkie. With him she had a third son, Henk. During their relationship there was always room to talk about Jakob. Jakob and Dikkie knew each other in the old days.